How do you feel about bananas? I am ambivalent about them. They are neither my favorite fruit (nectarines) nor my least favorite (papayas). They fall somewhere toward the bottom third of my fruit list. I don’t hate them but I don’t seek them out either. My children, on the other hand, love bananas. Spencer especially. And so I buy a lot of bananas and always think to myself that I can bake banana bread if they start to go bad. But then, no matter how many I buy, my guys eat them and so no banana bread is made. And then I realize that all is well in the banana world because I don’t really like banana bread anyway. Now really, was that the most fascinating paragraph you have ever read? This recipe comes from a cookbook with the unfortunate name of Cake Boy. It is a book that I would have undoubtedly passed by if the charming French author hadn’t made a stop at Book Larder. I didn’t get to meet him, although I hear he smelled like expensive cologne and was extremely handsome, and those facts made me take a second look at his book. An extremely decadent cream cheese brownie and a blueberry muffin that you fill and top with a blueberry compote were enough to make me buy it. (Note: I can’t wait for blueberry season.) 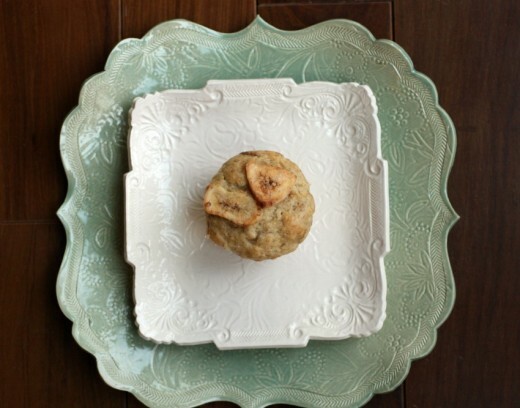 Cake Boy lived up to his promise for big flavor with these muffins – my family inhaled them. This recipe calls for self-rising flour – an ingredient used frequently in Europe but not as much in the States. You can easily make your own by adding ½ tsp. of salt and 1½ tsp. of baking powder to each cup of flour. Because this recipe calls for 2¼ cups self-rising flour, I just made 2 cups of the self-rising flour and then added another ¼ cup of all-purpose flour. I thought with the additional baking powder already in the recipe that these muffins might balloon out of control but they did not. I always buy superfine sugar (C&H makes it and you can find it on the baking aisle) but if you only have regular, you can grind it in a food processor. Or, I imagine, you can just use it as is. Report back if you do. Preheat the oven to 350ºF. Line a 12-cup muffin pan with paper liners. First, roast the bananas. Peel them, then place them on a large sheet of foil on a baking sheet. Sprinkle them with the dark sugar, vanilla extract, cinnamon, and rum. Wrap in a loose but secure package and cook in the preheated oven for 20-25 minutes. Allow to cool. Melt the butter and allow to cool. In a bowl, mash the roasted bananas well. With a fork, beat the eggs, melted butter, and milk in a second bowl. Add the mashed bananas and stir through. Sift the flour, baking powder, and superfine sugar into a large bowl. Make a well in the center and add the egg and banana mixture, stirring roughly with a fork (don’t overmix) until it is a lumpy paste. Spoon the mixture into the paper cups to the rims (I use a large ice cream scoop for this). Top each one with some banana chips. Bake in the preheated oven for 20 minutes. Rest the muffins on a wire rack too cool down. i make banana bread pretty often for hugh as he is a “morning pastry” guy and I find mushed bananas can keep things moist without needing a ton of fat. It crossed my mind a few nights ago that I knew I’d seen a muffin like this one somewhere but couldn’t remember where and lo and behold, you deliver! ps. love love the new dishes, great gift. 1st I DO love love love your plates..your SIL’s have great taste! And the muffins sound amazing! I just had a slice of banana bread last night. Someone brought it to our weekly potluck dinner and I realized it had been so long since I’d had any! I love the idea of roasting them first with brown sugar and rum, like an adult take on a familiar favorite! I’m SO not a banana person either. I basically only like them when they’re ALMOST not green. As soon as they’re all yellow, I want nothing to do with them. I do, however, like banana bread. And I’m pretty sure I’d LOVE these muffins. I hear roasted bananas are truly the way to go in such situations. 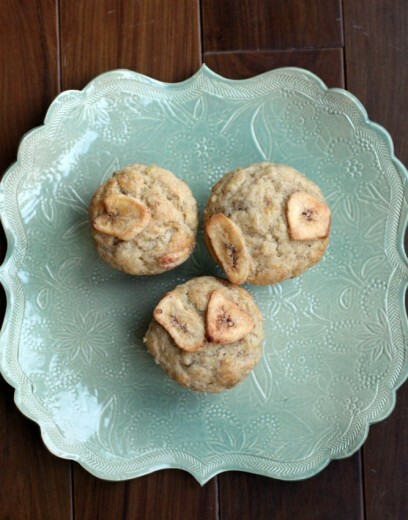 I have a pretty good banana muffin recipe but think I will try these to check. Normally my husband eats all our bananas but lately he’s missed a few so I have 2 in my freezer now waiting for a turn in the oven with some rum…mmmmm. Absolutely love the plates – especially the blue one! I hate bananas but I do like banana bread. Those dried bananas scare me a bit, but I’m willing to give this a try. Especially since I just cleaned out our freezer tonight and found 4 huge and black bananas hiding inside. 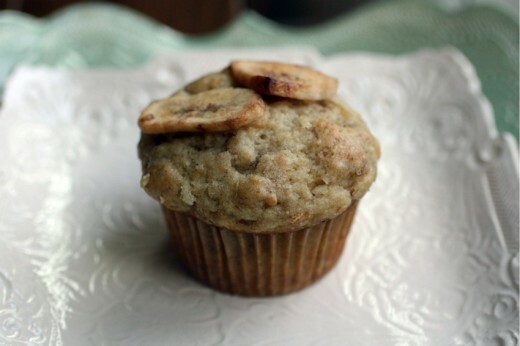 Time for banana muffins I think :) Happy new year, Dana! I love those plates! What an amazing gift. These look amazing. And I love the plates! You can just leave out the rum for sure. It’s actually optional but I included it in the recipe on my site because I loved it in there. I imagine brandy would be a good substitute if you want a little boozy kick. Dana – these muffins are beautiful! My husband doesn’t like baked goods that come without frosting, icing, or some extra sugar somewhere. I think he might go for these, though. Is there a hint of Bananas Foster in the flavor? Thanks for the self rising flour advice as well. 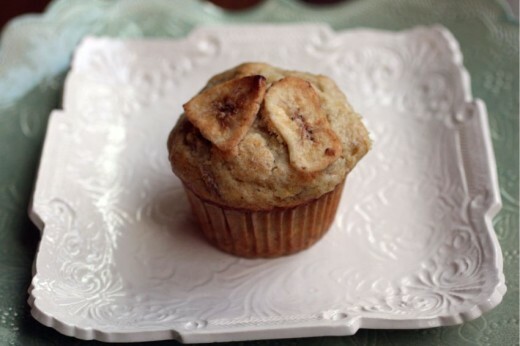 I’m dying to make these (I just roasted the bananas, yum! ), but I don’t see how many eggs it takes? I’m guessing it needs one or two. I also have your red lentil dahl on the stovetop, boy does my kitchen smell good on this dreary rainy day! Thanks! I LOVE bananas – but of course, growing up in Brazil, I am definitely spoiled. Ours (all modesty aside) are THE best in the world. Period. plus, there are so many kinds over there, I definitely miss the variety. Your muffins look absolutely delicious! It’s two eggs, sorry about that. Fixed in the post! Well I made them with 2 eggs after guessing, but they turned out so bitter! I was beyond bummed. I’m guessing it was because of the baking powder, but I’m not sure why since I followed your recipe. Any thoughts? Well, I just made a banana bread yesterday (I add chocolate chips to perk it up), but I wish I had seen this post first as these look delicious. Love your new plates and I will definitely have to check out Cake Boy! Bannans are HEALTHIER for U than apples. Ask a doctor. The plates are gorgeous. Talk about a perfect gift! I made these today and they were delicious- lightly sweet, moist, fluffy. The three non-banana eaters in the family ate them, while the major banana eater and only reason we have them in house (age 21-mo) threw his all over the floor. 75% success- yay! The only changes I made were omitting the banana chips because I have a major aversion to those and using (common) sugar that I didn’t process smaller. Very much enjoyed! Roasted bananas sound delicious. I don’t think the book title would have drawn me in either, but after seeing these muffins, I’ll have to have a look at it! I made this and played with the recipe since that looked like massive amount of leavening to me. I went with regular flour, 1 T. of baking powder, 1/2 t. baking soda, 1/2 t. salt. I reduced the sugar (I used raw organic sugar, not superfine) by 4 T. and used a sugar/molasses combo for roasting the bananas with since I am out of brown sugar. And because I had extra bananas I roasted an extra one and subbed it for half of the butter. The muffins are good. Making them again, I stick with the changes but bump up the butter content and sprinkle the tops with coarse sugar- especially since I cut down on the amount in the batter.